AOML's Ocean Chemistry and Ecosystems Division (OCED) and Physical Oceanography Division (PhOD) have conducted regular interdisciplinary observations of south Florida coastal waters since the early 1990's. How can we mitigate hypersalinity in Florida Bay with a minimal input of additional freshwater? How do we develop system-wide ecological indicators for use in reporting to congress and to the South Florida Ecosystem Restoration Task Force? How do climate cycles and weather patterns affect hypersalinity in Florida Bay? What are the long-term trends in chlorophyll a for south Florida coastal waters? 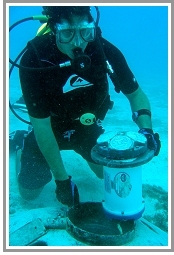 Over the years, the AOML SFP and its affiliated field operations, have enabled scientists and resource managers to keep a watchful eye on the sensitive marine habitats found in the region and have served as a sentinel during periods when the ecosystem has been subjected to extreme events such as hurricanes, harmful algal blooms (HAB), and potential oil spill contaminants. Additionally, the AOML SFP has produced a comprehensive, long-term baseline for regional circulation, salinity, and water quality for the ecosystem. The AOML SFP integrates data from environmentally and economically important areas, including three national parks (Biscayne, Everglades, and the Dry Tortugas) as well as the Florida Keys National Marine Sanctuary (FKNMS). Economic activity associated with the FKNMS alone was worth $6 billion and 71,000 jobs in 2001. Sustained measurements that have been supported by the AOML SFP include synoptic interdisciplinary bay-wide and regional shipboard surveys, a moored oceanographic instrument array, and Lagrangian surface drifter deployments. The AOML SFP was originally designed to fulfill NOAA's responsibility to South Florida Ecosystem Restoration and the ongoing Comprehensive Everglades Restoration Plan (CERP). The capabilities developed as a result of the AOML SFP have enabled NOAA to respond quickly to extreme events, which have originated both locally (e.g. "black-water", HABs) and remotely (e.g. tropical cyclones, oil spills), by adapting/modifying routine sampling via ships and small boats. As NOAA moves forward in the development of a new coordinated long-term science plan for the Gulf of Mexico, it will be important to incorporate regional coastal components such as the AOML SFP into the larger mosaic. The development of baseline metrics for the larger region will have to rely heavily on data already assembled from the few existing observational programs operating throughout the Gulf. Management and maintenance of long-term environmental records such as the AOML SFP data time-series is critical. These data are required to determine the natural system variability (spatially and temporally), and are a precursor to quantifying and assessing the impacts of more intermittent, extreme events which can affect the region, be they natural (e.g. hurricanes, HABs) or man-made (e.g. oil spills).